Another helping of hump-day hilarity! Tim Gilbert has been a fixture on Toronto’s alternative comedy scene for almost a decade, and is one of the most consistently funny comedians in the city. He’s a member of Laugh Sabbath, a group that boasts alumni like Nathan Fielder. Tim released his first album, Please Help Me I Am Very Sick, as a pay-what-you-want download on Bandcamp. Tim has performed across Canada and the US and has appeared multiple times at the Just for Laughs festival in Montreal. Tim’s writing credits include CBC’s 22 Minutes and The Score. Tim looks forward to meeting you and your grandparents! 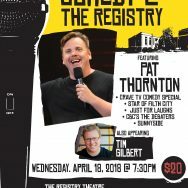 Pat Thornton is a Canadian stand-up comic, television actor, sketch comedian. A founding member of the sketch comedy troupe The Sketchersons, he has also appeared in sketch comedy programs Hotbox and Sunnyside. Pat’s acting roles have included a recurring role in the CTV sitcom Satisfaction, the web series Space Janitors and Everyone’s Famous, and guest appearances in Warehouse 13, Working the Engels, Spun Out and Royal Canadian Air Farce. He garnered two Canadian Screen Award nominations in 2014, in the categories of Supporting Actor in a Comedy Series for Satisfaction, and Performance in a Program or Series Produced for Digital Media for Everyone’s Famous. Pat can also be seen as the lead in the critically acclaimed independent feature Filth City where he plays Mayor Tom Hogg.